I have to admit that I am not the biggest fan of thrift store shopping. Don't get me wrong, I'm not opposed to it or think that I'm too good for thrift stores. My problem is that I hardly ever find the things that I am looking for. When I go to the thrift store, I'm usually looking for hardly used pants and shirts. I've posted before that I am not the most patient person so It's really hard to look through hundreds of pairs of pants. Especially when there are multiple combinations of sizes and lengths all there together in no particular order. I'm more than happy to buy and wear good quality clothing from the thrift store. As a matter of fact, just a few weeks ago, I was able to find a pair of khaki's for $4 that had never been worn and still had the original tags on them. My aunt on the other hand is the thrift store queen. She buys all of her clothes from thrift stores and I don't think she had been to the mall in years. I can only imagine how much money she's saved just from buying her clothes at the thrift store instead of the big department stores. I went with her on one of her thrift store shopping sprees and picked up a couple of tips I'd like to share. Be Open Minded. Since the inventory changes daily, you never know what you may find. You may go in one day and not find anything that you can use. You could go back the next day and find a tons of items. Most thrift stores have a range of items such as clothing, housewares, furniture, electronics, outdoor furniture and books. High Income Neighborhoods. My aunt has found that by going to thrift stores in high income areas, the items are usually of higher quality and in better condition. Most times, she is able to find clothing that still has the original price tags on them. Return Policy. Since most thrift stores do not accept returns, be sure you check and make sure any electronics you purchase work properly before you leave the store. Most of the thrift stores I've been have dressing rooms allowing you to try on the clothing before you purchase it. Some stores do have a 7 day return policy so make sure you check on the store's return policy if your aren't sure about an item. Sale Days. Some stores have certain days when a special color tag is at a special price. For example, on Tuesdays, all green tags may be 50% off. Are you a thrift store shopper? What tips can you add? Like this post? Consider subscribing to SingleGuyMoney. If you aren't sure if there are dressing rooms, or know it is a crowded store, wear bike shorts and a sports bra or a bathing suit, so you can try on clothes more easily. No matter how good it looks on the hanger, trying on is a must! Thrift stores in fancy neighborhoods are a must. In Lincoln Park in Chicago the Salvation Army there routinely has Brooks Brothers shirts for $5. You can also catch big name brands like Ben Sherman, Banana Republic and J. Crew. While men's pants are tricky, I find it's easy to find high quality men's dress shirts at these places. Nice post! If you hate going to thrifts, why not have someone who likes it (your aunbt, a friend) get stuff for you. I find near new men's shirts almost every time I go to a thrift. Then you could repay the person for shopping for you--by a doing a task you don't mind that your shopper hates. That way, each could use his or her own talents! 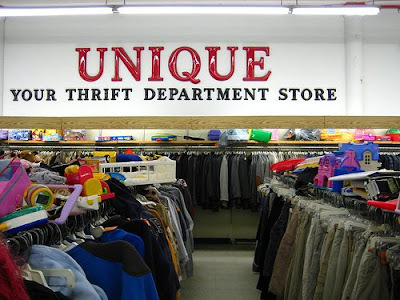 Even if you don't like to shop for clothes at the thrift store, pop in and look for other things. It's usually quicker and sometimes you can find some good stuff!